A service was held at Pocklington's new surgery to dedicate a new memorial to seven aircrew who crashed there in 1943. A service was held at Pocklington’s new doctors’ surgery to dedicate a new war memorial to seven aircrew from 102 (Ceylon) Squadron who crashed there on 29 March 1943. The memorial comprises a restored Halifax bomber engine discovered at the site of the new surgery, on West Green, and a plaque featuring the names of the seven crew members. 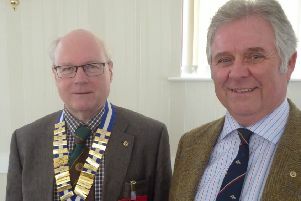 The service was attended by former RAF Pocklington veterans, local civic leaders, representatives of the services and British Legion, doctors and staff from the new surgery, called ‘The Beckside Centre’. Relatives of four of the airmen killed in the West Green crash also attended. The 102 (Ceylon) Squadron veterans were Tom Sayer and Joe Wilson both now in their 90’s. Representatives of the organisations who played a part in constructing the memorial were invited. They included the Lindum Group who constructed the plinths and cover, Maddison 4 x 4 from Thirsk who restored the engine and Timeless Memorials from Hull who prepared the stone plaque. People travelled from far and wide for the noon dedication on Sunday (10 May). The families of Douglas Harper, William Jenkins, Frank Dorrington and John King were able to attend. The latter was a policeman before joining the RAF and a representative of the Hampshire Constabulary was present to pay their respects. One of the directors of the Lindum Group Neil Coote, flew himself to Pocklington from Lincoln for the service in a private aircraft landing at the Wolds Gliding Club. Local people also gathered on the other side of the beck to watch the service. The dedication service was led by the Rev’d Jan Hardy from St Catherine’s Church in Barmby Moor where three of the crew are buried. A letter from was read out by Elaine Kularatne, wife of the 102 Ceylon Squadron Association secretary Simon Kularatne, on behalf of Karen Vinnes, the niece of one of the pilot, Wilfred Phelps Comrie. A wreath was laid on the squadron memorial at the Wolds Gliding Club immediately after the dedication service. The two Real Aeroplane Company aircraft, and the Battle of Britain RAF Dakota which arrived later, made a special fly past over the memorial in recognition of the day. A very successful 102 Squadron annual reunion dinner was held on the Saturday (9 May) night at the Wolds Gliding Club with an after dinner presentation from Dr John Wright, who is head of the Collections Department at the Yorkshire Air Museum. The reunion was timed to support the Flying Man Festival in Pocklington. On Sunday Evening at All Saints Church, an audience of 200 local people heard the retiring chairman of the Squadron Association, Tom Sayer, give a talk about his experiences in the RAF and his time at Pocklington as a pilot.